John W. Foster was an American politician, diplomat, journalist, and U.S. Secretary of State (1892-93). Foster was also a veteran of the American Civil War, a respected lawyer specializing in international law, and author of several books detailing his many years of diplomatic service. Following his brief stint as Secretary of State, he served as an influential advisor to the Chinese during the Sino-Japanese war of 1894-95. He was responsible for drafting the Treaty of Shimonoseki which ended the war, ceded Taiwan (Formosa) and other territories to Japan, and brought formal Chinese recognition of Korea's independence. Date and place of death: November 15, 1917, Washington, D.C. Wedding took place at the Glendale Female Seminary, in Glendale, Ohio. Note: Sarah Kazar was John's stepmother. Burial site: Oak Hill Cemetery, Evansville, Indiana, U.S.A.
* John Watson Foster was not born in "Evansville, Indiana" as a few sources erroneously report. He was born in Petersburg, Pike County, Indiana, and later raised in Evansville, Indiana, where the Foster family moved in 1839. NOTE: John Foster Dulles was not John's son as a couple of sources mistakenly claim. Dulles, who served as U.S. Secretary of State in President Dwight D. Eisenhower's cabinet, was actually his grandson. John Foster Dulles was the son of John's eldest daughter Edith Foster. Matthew Watson Foster immigrated to the U.S. from England at age twelve. In 1819, he put down roots in Pike County, Indiana, and became one of the earliest merchants in that county. He initially lived on a rural 80-acre parcel before moving into Petersburg, Indiana. John Watson Foster was Eleanor and Matthew's third child, born March 2nd, 1836. 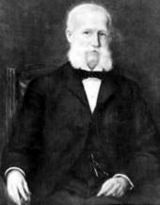 In 1839, the young family moved to bustling Evansville, Indiana, where Matthew ran a thriving general store and was later elected probate judge. The Foster family grew to include eight kids before John's mother died in 1849, while assisting victims of a riverboat disaster. After a second marriage, the family would eventually grow to include a total of ten children. John Foster was a gifted and scholarly student throughout his schooling and was valedictorian of his 1855 Indiana University class. It was after he established his law practice in Evansville, Indiana at age 21 that he became heavily involved in civic affairs. John was an ardent abolitionist and was a tireless worker in the presidential campaign of Abraham Lincoln. John W. Foster served with distinction in the Union army during the American Civil War. Commissioned a Major in the 25th Indiana Volunteer Infantry, he was a key participant in the Battle of Shiloh and was later assigned to assist General Ambrose Burnside. He rose to the rank of Colonel before commanding the 65th Indiana Volunteer Mounted Infantry, then moved on to the 136th Regiment. He ultimately attained the rank of brigadier general. Following his military service, he invested in, and was editor of the Evansville Daily Journal. His prominence within the Republican Party continued to grow, and led to his being named Chairman of the Indiana Republican State Committee. John W. Foster's career as a diplomat began in 1873 as the U.S. representative to Mexico. He held the position until 1880 when he was dispatched to Russia for a brief stint as U.S. representative to that nation. He was next appointed U.S. Minister to Spain in 1883, and served in that position until 1885. Foster was a highly-regarded diplomat and international relations attorney, and is actually considered by some to be America's first professional U.S. diplomat. When Secretary of State James G. Blaine abruptly resigned in 1892, Foster was quickly named U.S. Secretary of State during President Benjamin Harrison's Administration. He spent a great deal of his time working toward the annexation of Hawaii, and issues related to Cuba and Puerto Rico. One of his greatest achievements occurred after he'd left public office. The former Secretary of State was instrumental in drafting the Treaty of Shimonoseki, which brought the Sino-Japanese war of 1894-95 to an end. In addition to bringing peace between China and Japan, the 1895 treaty was notable for China's recognition of the independence of Korea and their relinquishment of Taiwan (Formosa) and other territories. Throughout the 1890s he was a trusted legal consultant on matters of international law and ran a flourishing international law practice in Washington. During those years he maintained a residence at 323 18th Street N.W., Washington, D.C., and a summer home in Henderson Harbor, New York. Ambassador Foster was frequently called on to utilize his global contacts to settle territorial disputes, and negotiate reciprocity trade agreements between governments. He also held important posts with the Carnegie Endowment for International Peace, the American Red Cross, and helped found the American Society of International Law. Though his mind remained sharp, his health declined sharply in his final months. He died November 15th, 1917, at the age of 81. Some of his grandchildren went on to illustrious careers in the public sector as well. They include, John Foster Dulles, who later served as U.S. Secretary of State in President Dwight D. Eisenhower's administration, as well as Allen W. Dulles, Director of the Central Intelligence Agency (CIA), and Eleanor Lansing Dulles, an economist, author and State Department official. The most in-depth of more than two dozen sources consulted in preparing this profile, was the 1981 biography, John W. Foster: Politics and Diplomacy in the Imperial Era, 1873-1917, by Michael J. Devine.